As the year draws to a close it is only natural to look back at what has been, and forward at what might be. This is doubly important for the global clean energy industry and the policies which support its efforts to combat climate change and enact the core target of the Paris Climate Agreement. Given the breadth and scope of climate policy, we can only accomplish a brief summary of all that is ongoing around the world, especially when you take into account ‘climate policy’ refers also to corporate and financial decision-making, on top of those being made by local, regional, state, national, and supranational governing bodies. We started 2018 wondering what impact 2017 would have, and what we accomplished. As always, it took a few months, and when it finally arrived the news was mixed — as it normally is. The International Energy Agency (IEA) announced in March that global energy demand increased by 2.1% in 2017, more than twice the previous year’s rate. Similarly, carbon emissions increased for the first time since 2014, jumping by 1.4%. At the same time, however, global renewable energy generation capacity increased by 167 gigawatts (GW) in 2017, pushing the planet’s cumulative renewable energy capacity to 2,179 GW, according to numbers published in April by the International Renewable Energy Agency (IRENA). With this duality in mind, attention remained heavily focused on how countries were working to meet the goals of the 2015 Paris Agreement — considering that renewable energy levels were increasing steadily but, as highlighted by increasing energy demand and emissions, not fast enough. A study published towards the end of April by the London School of Economics & Political Science revealed that all 197 countries, nations, and territories that have signed and ratified the Paris Agreement had at least one national law or policy focused on climate change. In all, the study detailed over 1,500 climate laws and policies are in place around the world, including 106 which have been introduced since the Paris Agreement was signed, and of which 28 specifically reference the Paris Agreement. Further, 139 countries have framework laws that address climate mitigation or adaptation from which further action can and hopefully will be forthcoming. That being said, however, there is still a nearly overwhelming amount of work to be done, and in many countries, the level of accomplishment and ambition is minimal at best. This is highlighted best by a November report published by The Climate Group, CDP, and PwC UK which revealed that leading states and regions across the globe have committed to decarbonizing at a rate of 6.2% per year, 3.2% faster than G20 governments and just short of the rate necessary to align with a 2°C pathway. Specifically, 120 states and regions from 32 countries which disclosed their climate action and targets to The Climate Group and CDP (formerly the Carbon Disclosure Project), accounting for 21% of the global economy and 627 million people, were found to be more ambitious in their decarbonization plans than the NDC targets set by G20 nations. States and regions analyzed in the report have hit a decarbonization rate of 6.2%, just shy of the 6.4% rate necessary to align with a 2°C pathway. A month earlier, PwC published its own Low Carbon Economy Index for 2018 which continued the bad news, revealing that not only are emissions on the rise again for 2018, but that there is not a single country achieving the decarbonization necessary to limit lobal warming to the necessary 2°C as laid out in the Paris Agreement — let alone its 1.5°C aspirational target. These figures highlight the discrepancy between national targets and local action, revealing a frightening level of national apathy, apathy which is further cast in a dim light by the actions of corporates and financial institutions around the world. The most important role being played to shift corporate business practices towards supporting and boosting renewable energy growth is that being played by the RE100 initiative, The Climate Group’s global initiative formed in partnership with CDP (formerly the Carbon Disclosure Project) that brings together companies committed to 100% renewable electricity. Two reports from the initiative, published within two months of one another, show just how important the role of corporates is for renewable energy growth. The report showed that RE100 companies “consistently perform better than non-members on two key financial indicators: net profit margin and EBIT margin (Earnings Before Interests and Taxes” — with the gap between RE100 companies and those without renewable energy targets ranging from 0.3% to 7.7% across all sectors (though most prominently in IT, telecommunications, construction, and real estate). Two months later, the RE100 initiative announced that it had added 37 new companies so far in 2018, bringing the total number of RE100 companies up to 155 operating in over 140 markets around the world. 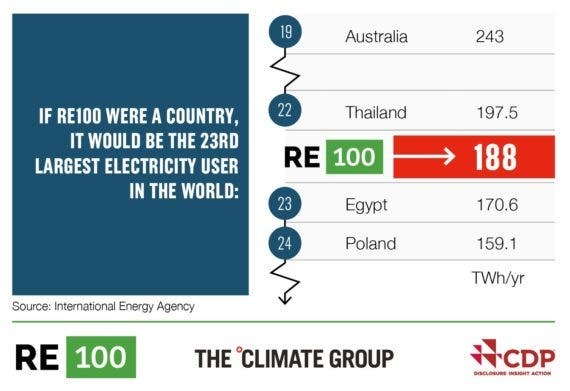 Put another way, if the members of RE100 were combined into a country, they would represent the 23rd largest electricity consumption on the planet at 188 terawatt-hours (TWh) annually, and boast combined revenue of $4.5 trillion, or around 5% of global GDP. “With so much depressing news at the moment, here we have a refreshing, positive story of how ambitious corporate action is changing the world for the better,” said Helen Clarkson. “We congratulate RE100 members on the progress they are making by building renewables into their growth strategies, and engaging policymakers and suppliers. This is what all leading multinationals should be doing. Tangentially, in September, the Science Based Targets initiative revealed that more than 130 new companies had joined through 2018, pushing the total number of companies close to 500 and representing approximately one-eighth of total global market capitalization. Since then the number has continued to increase, and as of writing 505 companies have committed to implementing science-based targets. But the entire year felt, rightly so, that it was leading to the 24th Conference of the Parties to the United Nations Framework Convention on Climate Change, better known as COP24, which was held in Katowice, Poland, over the first two weeks of December. Mired in a political mess worthy of a summit involving every nation on the planet, COP24 was unfortunately highlighted not by a comprehensive Paris Rulebook, but rather a mediocre agreement that nevertheless solidified the need for regular communication, reporting, review, and stock-taking of global progress on curbing greenhouse gas emissions, adapting to the impacts of climate change, increasing and aligning investments, and considering loss and damage. In addition to the end result of the summit, COP24 was marred by the work of the US Government which held its much-ballyhooed fossil fuel side event, much to the derision of many. One of the key stumbling blocks for the talks was presented by the United States, Russia, Saudi Arabia, and Kuwait, which objected to the way the other countries wanted to reference the Intergovernmental Panel on Climate Change’s (IPCC) Special Report on Global Warming of 1.5°C. The report, published in October, warned that “Limiting global warming to 1.5°C would require rapid, far-reaching and unprecedented changes in all aspects of society.” However, the four countries listed were intent on ensuring that the report bore little to no weight in the resulting Paris Rulebook. What, then, can we take away from 2018, and what can we expect (or, more pointedly, what should we expect) from 2019? I turned to several experts to answer these questions for us, and instead of trying to cull and paraphrase my way through the terrific answers provided, I’ll quote them below in full. It might look like a lot of reading, but given the expertise of those speaking, they are definitely worth digesting. How important was 2018 for the global clean energy industry? Sam Kimmins, Head of RE100, The Climate Group: This year we’ve seen huge growth in the numbers of companies committing to using 100% renewable electricity, and in the amount of renewable electricity that they are buying. 2018 will be remembered as the year scientists gave their starkest warning yet on the impacts of 1.5°C of global warming. But it’s also the year the corporate movement for renewable electricity started to go truly global. The 159 Members of The Climate Group’s renewable electricity initiative RE100 are now operating in over 140 markets – and sourcing of renewable power of these companies is up 41% on the previous year. We’re also seeing strong signals of change in the electricity system. Renewable energy is getting ever cheaper. Energy utility Northern Indiana Public Service Company (NIPSCO) is on track to entirely phase out coal use and replace it solely with renewables by 2030 – based entirely on the business case for low-cost renewables. The world’s largest lithium-ion battery, built by Tesla and powered by wind energy, is now providing electricity to the grid in South Australia and outperforming conventional turbines on cost and response rate. 76 companies based in Australia have committed to or are running on 100% renewable – demolishing the national government’s argument that coal is king. These are just a few of examples of a deluge of signals and trends that prove that the clean energy transition is happening, and 2018 has been a positive year for its growth. Nicolette Bartlett, Director of Climate Change, CDP: 2018 was a big year for the renewable energy revolution, hitting a major big milestone, with one trillion watts of wind and solar capacity now installed. It was a year that saw further global expansion of the RE100 initiative, which consists of companies that have committed to 100% renewable electricity and is a collaboration between CDP and The Climate Group. As we discuss in our annual report, this year 37 new companies signed up to the initiative, bringing the total to 158 members. Crucially, this creates demand for over 188 terawatt hours (TWh) of renewable power per year, more than the electricity consumed by Egypt. This year, RE100 gained new members for the first time in Australia, Mexico, Taiwan and Turkey. Clean energy is on the agenda in city hall as well as the boardroom. Earlier this year, CDP released data showing that 100 cities around the world are already sourcing the majority (70% and over) of their electricity from renewable sources. Patrick McCully, Climate & Energy Program Director at Rainforest Action Network (RAN): Perhaps the most significant single thing for the global clean energy industry in 2018 was the October 2018 report by the UN’s climate science panel on the vital importance of keeping global warming under 1.5°C. The report shows more clearly than ever the need for a rapid, economy-wide transition from fossil fuels to a clean energy economy. It served as a 5-alarm wake-up call to governments, investors and civil society and will make a major contribution to shaping the policy debate on clean energy in the coming years. What needs to happen in 2019 for the global clean energy industry to grow as necessary? Sam Kimmins, RE100: Education is needed, as there are still some persistent myths about the reliability, compatibility and cost of renewables – with some policymakers and their advisors basing decisions on old facts and yesterday’s assumptions. Nevertheless, many countries are beginning to wake up to the shift to renewables – it’s happening across Europe, at State level in the US, in Australia, South Korea, Taiwan, and Japan – all markets that The Climate Group’s RE100 members are active within. Nicolette Bartlett, CDP: We want to see science-based targets go mainstream. In the first nine months of 2018, we saw a nearly 40% surge in companies setting ambitious emissions reduction targets aligned with the Paris Agreement, compared with the same period in 2017. We fully expect to see this continue to rise in 2019, as more business leaders become aware of the benefits. For example, A YouGov survey for the Science Based Targets initiative this summer found that 63% of executives believe the setting of tough targets which are scientifically aligned with the Paris Agreement is helping unlock innovation. When companies set ambitious emissions reduction targets, this naturally drives them to source more renewable energy as this is one of the fastest and most cost-effective ways to slash emissions. We also expect more companies to join the RE100 initiative and the EV100 initiative in the coming year, signalling their ambition to use renewable power and move to electric vehicles. Patrick McCully, RAN: Banks, insurance companies and other parts of the global finance sector need to accelerate their transition of capital and financial services from dirty to clean energy. As finance for dirty energy dries up, it will be easier to push governments to tighten clean energy targets and adopt policies that ensure a just transition away from fossil fuels by providing funds to impacted workers and communities. In the US, nothing positive can be expected at the federal level except perhaps on opening offshore areas to wind power. But the incoming democratic governors and state legislators can make a major difference by adopting incentives and targets for renewables and electric vehicles and restricting support and permits for pipelines and other dirty energy. What needs to happen in 2019 in policy and financing for climate mitigation and adaptation to grow as necessary? Sam Kimmins, RE100: Policymakers need to recognize the investment opportunity represented by corporate sourcing of renewables. As soon as possible, energy markets need to be opened up to enable companies to engage in PPAs, self-generation and other new ways of investing in renewable electricity. Importantly, national governments need to stop spending money on propping up coal and other fossil fuels and instead move towards investing and transitioning jobs from these twilight industries into renewable, future-proofed industries. The transition to renewable energy is happening, and the job of policymakers and governments is to ensure that the transition is a well-planned, fair and sustainable one. Nicolette Bartlett, CDP: Companies, investors, cities and states are already leading the way, yet they need national policy to enable them to go further and faster. By setting clear rules, governments can map the direction of travel, while government support for the IPCC’s findings will mark the destination. In 2019, we want to see governments send appropriate signals and set the enabling environment to allow the real economy to go further. This means preparing to upgrade their nationally determined climate pledges at next year’s COP25 climate conference. A key moment to look forward to will be the UN summit in September 2019 in New York. The aim is to mobilize political will and raise real ambitions to achieve the goals of the Paris Agreement, focusing on finance, energy transition, industry transition, nature-based solutions, cities and local action, and resilience and adaptation. It will be an opportunity for the real economy to showcase their transformative action in support of the Paris goals, ahead of COP25 in Chile. Together, this will hopefully show ambitious market and political signals and inject real momentum into the COP25 negotiations. Our latest research on sub-national governments shows states and regions have committed to decarbonize much faster than national governments, at a rate of 6.2% a year, which is just 0.2% away from the decarbonization rate needed to align with a 2°C pathway. To accelerate this low-carbon transition, CDP also wants to see governments make private sector disclosure mandatory on environmental impacts, risks and opportunities, to ensure that the global financial system is stable and sustainable. Additionally, governments should send a clear signal to markets that economy-wide carbon prices rising in line with science can be expected both now and in the future. Patrick McCully: Strong state-level leadership in the US. At the international level, we need the countries that have spoken up for climate change to push hard at the UN General Assembly in September and the climate talks in November for greater ambition in terms of emission reduction targets and increased global finance for mitigation and adaptation. How important will non-state actors be in driving global financing and policy movements in 2019? Sam Kimmins, RE100: Non-state actors are vital in driving global financing and policy movements. 2018 has seen the huge galvanization of the power of cities, states, regions, and businesses at the Global Climate Action Summit (GCAS) as well as the 10th Climate Week NYC in New York, which The Climate Group organizes each year. The messages of state and regional governments, businesses and cities were taken to national governments at COP24 this December – they were responsive, but not nearly as ambitious as we all need to avoid the catastrophic consequences of global warming warned by the IPCC’s special report. The corporate sector, on the other hand, has proven to be way ahead in their thinking, embracing new energy technologies and demonstrating to national governments that there is a strong market for renewables. They are demonstrating above all that renewables make business sense and are putting their money where their mouths are. At The Climate Group, we only see this trend accelerating in 2019, as the business case becomes even clearer. Renewables are cheaper than fossil fuels. This is hard for some people to digest, but it’s important that policymakers and their advisors get to grips with this new reality. Change is happening fast – and we need it to go faster. That will be the challenge of 2019 – ratcheting up ambition and speeding up the transition. Nicolette Bartlett, CDP: It’s clear that we urgently need to scale and accelerate environmental action in 2019. In 2020 nations will need to update their national climate plans for the Paris Agreement, just as global emissions need to peak. Given the sobering news that GHG emissions rose again in 2018, next year is more critical than ever. To stay below the 1.5°C guardrail, the IPCC research tells us the global economy needs to reach net zero carbon by mid-century and halve emissions by 2030, compared with 2010 levels. This represents nothing short of a complete transformation of the global economy and it’s clear that national governments cannot do this alone. A transformation of this scale is going to take unprecedented collaboration between companies, investors, cities and states working together across all sectors. In 2019, an important part of this will be showing national governments that business and regional governments are ready for ambitious climate action, giving them the confidence to upgrade their national climate pledges and set ambitious policies. Patrick McCully: Civil society around the world will play a vital role in pushing financiers, corporations and local and national governments to take action on clean energy in 2019. This will be expressed in many ways, ranging from important research and analysis to protesting against fossil-fuel friendly banks like JPMorgan Chase, to people putting their bodies on the line by directly blocking the construction of pipelines and dirty power plants. How important was 2018 for the US clean energy industry? Rachel Cleetus, Policy Director, Climate and Energy Program Union of Concerned Scientists (UCS): In 2018 the US saw a continuation of the ongoing shift away from coal-fired power to cleaner generation resources including renewable electricity and natural gas. According to the EIA, US coal consumption in 2018 will be the lowest in 39 years and this year will also be the second highest for coal retirements. Meanwhile, renewable electricity provided about 18% of generation and CO2 emissions were down 28% from 2005 levels. Costs of renewable energy continue to drop, making them increasingly economically attractive. (See this brief from IRENA, for example, which shows that global costs of electricity (LCOE) from utility-scale solar PV have fallen 73% between 2010 and 2017, and for onshore wind have fallen 23% in that same period). Renewables paired with storage became a cost-effective reality for many utilities. Over the past few years, utilities have found renewable energy to be the lowest-cost option for new power. However, in 2018, we saw a new trend: utilities finding renewables with storage becoming the lowest-cost option for new power, and even lower cost than running some of their existing coal plants. This represents a significant breakthrough: utilities can now cost-effectively procure renewable projects that can be dispatched and used when demand is highest. This means that clean, renewable power can be used and relied upon like traditional natural gas plants. For example, Arizona Public Service – with First Solar – is building “peaking” solar plants that will provide power day after day during the early evening (3 pm to 8 pm) when demand is high and the sun is setting or set. This has had ripple effects across the entire US in 2018. This year, utilities in Indiana, New Mexico, Michigan, Oregon, Colorado, and the upper Midwest, all announced that closing their entire coal power portfolio was the cheapest option for the future. These utilities are investing in mostly renewables and storage to replace this power. State commitments and policies reached new heights, sending a strong signal to developers and utilities that the future will be clean. 7 States + DC now require their utilities to procure at least half of their power from renewables: CA, HI, NY, OR, VT, NJ, and NV (first of two ballot initiatives passed in 2018). And a number of newly elected governors, including new governors in IL, MN, and NM have also pledged to introduce legislation to increase their state renewable targets to 50% or more. States (and utilities) also began making ever cleaner pledges. In CA, NY, DC, and HI – will all require 100% “clean” or zero-carbon portfolios in the future. Annual corporate-driven clean purchases doubled over previous records. The same cost declines in renewables (with and without storage) that have allowed utilities and states to greatly increase clean energy investments and targets have also hit the business sector. Clean energy investments by corporations in 2018 have already been double the previous annual records. As of November 2018, corporations in the U.S. signed over 7.5 GW of new wind and solar power purchase agreements – more than all of the installed wind & solar capacity in Iowa. These businesses are also looking forward and changing the way they think about and use energy to be truly 100% clean. For example, Google has a new goal to be “24×7” clean (they already are 100% renewable – with enough environmental certificates (RECs) to meet their annual load). Lou Leonard, World Wildlife Fund’s (WWF) Senior Vice President for climate change and energy: This has been a banner year for renewable energy. For the fourth year running, a majority of net new power capacity in the US has come from renewable energy. Corporate electricity procurement shattered the previous record year by over 30%. Large majorities of the American public support renewables, climate action and the Paris Agreement. Businesses, states and local governments have stepped to help drive demand for an industry growing nine times fasterthant the rest of the US economy. There’s been a seismic shift in leadership on climate change and renewables from Washington, DC to Main Street, USA. Businesses, states and local governments have stepped in to fill the leadership gap and keep strong signals flowing to the market. Existing commitments by these new leaders can bring the US halfway toward its international climate goals. But even more is needed to fill the remaining emissions gap toward a trajectory that limits the worst droughts, wildfires and superstorms from bearing down on American communities. By not just making their own commitments but by collaborating across stakeholders and sectors, these new leaders can do more to transform food, electricity and transportation systems in America. What needs to happen in 2019 for the US clean energy industry to grow as necessary? Rachel Cleetus, UCS: Market trends, and actions by states and non-state actors will continue to be the main drivers of clean energy deployment in the US in 2019. Some exciting things to watch for include developments in the offshore wind industry (See this blogpost from my colleague John Rogers for more), energy storage (led by falling prices and state policies in CA, NY, NJ and MA for starters) and electric vehicles (see this blog post from my colleague David Reichmuth, although there are concerns about what will happen to the EV tax credit). Rachel Cleetus, UCS: Despite these promising trends we are seeing (mentioned above), there’s no doubt we need to go further faster to meet our climate goals. The Trump administration’s rollback of several climate policies is taking us in precisely the wrong direction. In the near term, state, local and non-state actors will have to take on the mantle of leadership to drive continued clean energy progress in the US. We’ll be watching states where incoming governors have pledged to uphold the goals of the Paris Agreement by accelerating a clean energy transition in their state. Recent climate and extreme weather events–including hurricanes Florence and Michael, the devastating California wildfires and heatwaves, droughts and flooding events around the country–make clear that climate change is already having an impact on people. To keep communities safe, we must invest more to build resilience ahead of disasters, not just pick up the pieces their aftermath. This includes increasing the budget of FEMA’s pre-disaster mitigation program and HUD’s community development block grant program. (See more in this blog post I wrote last year). There is considerable interest in a federal infrastructure bill this year–we should use that as an opportunity to ramp up investments in low-carbon, climate-resilient infrastructure. How important will non-state actors be in the United States in driving global financing and policy movements in 2019? Rachel Cleetus, UCS: Non-state actors will continue to play a critical role in driving the US and global clean energy transition. As Jeff’s blog post highlights, we have seen major renewable energy commitments from US utilities and corporations recently. To keep pace with climate goals, though, we do need a strong policy push as well–which is why, in the absence of action from the federal government, state renewable energy and carbon pricing policies are vital.